Nassau, Bahamas - For most Bahamians, the name Richard Coulson conjures images of a man whose highly regarded and occasional columns in The Tribune are literary gems. Thought-provoking, free of political bias, Coulson’s comments are packed with practical solutions to what seem like overwhelming decisions – what to do about direct foreign investment vs. domestic, how to handle privatization, what happens when education doesn’t educate the masses. But far beyond being the Nassau-born, world-travelled pundit whose observations generate cocktail party conversations and political round-table debates, Coulson is a man with a fascinating professional and social past that has taken him from the offices and living rooms of the top financiers of Europe to the deepest recesses of Iraq and Malaysia, with the beauty and the contrasts of Mexico a constant thread both in his work and his private life. 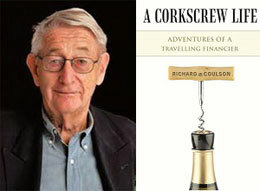 In his just-released memoir, A Corkscrew Life, Coulson is the consummate storyteller, recalling details that no one of ordinary memory could remember – the abruptness of a sea-change from Ivy Leaguer to Army life digging bunkers and fighting bureaucratic battles in post-war Korea, followed by a career starting as the young lawyer, married with first child on the way, told to leave New York City and go to Mexico and do whatever had to be done to restore that country’s international reputation in financial markets after its former governments had gobbled up privately held properties and bank accounts. Coulson’s stories of Mexico lay bare a country of two sets of ruins: ancient ruins he would treasure, newly-minted, manmade ruins he would be partially responsible for repairing. Long hours and longer documents helped heal the wounds of a government and establish Coulson as the financier with an eye and the patience for detail that could turn the barely possible into the readily desirable. It was a skill that would serve him well in putting together documents and offerings for private placement and initial public offerings time and again in a career that spanned five decades. If Mexico figures prominently in Coulson’s memoir, it is perhaps because that unique country filled with villains and art, mountain ranges and serene beaches, turmoil and tranquility has become the geographical glue that captured the heart of a man whose own life and upbringing were as diverse and fascinating as the country with multiple personalities. But just as prominent a thread is the thrill Coulson found in sailing, a sport that seemed second nature to the boy who grew up with the sea in his back yard. Young Richard Coulson was born to a mother with two husbands, one in New York, and the other in The Bahamas. Richard respected both men immensely, Sidney Farrington who, according to birth records was his father and whose last name he initially knew as his own, and Robert Earle Coulson, known as the Colonel, to whom she was married before and after Farrington. Her charm managed a balancing act that kept both men fascinated and vying for her singular affection. Like his mother, young Richard continued to think of both men as important aspects of his life. For a good part of the year, he and the beautiful woman who seemed to make friends and be accepted into social circles wherever she went despite her unorthodox lifestyle, made New York their home with the Colonel and for the other months, interspersed with jaunts to Marblehead, Mass., lived in Nassau in a house called Folly on East Bay Street frequented by Pan Am executive Farrington. Surrounded by lively conversation, parties, sailing, politics, Coulson had the kind of treasured youth unfettered by electronic games and after school clubs. He learned by listening to adults debate and by the time he was sent off to boarding school in South Carolina at age 10, the habit of travel was ingrained. He went on to graduate from Yale College and Law School, taking a job with a New York law firm that would set him on the path of learning that where major finance matters arose, legal legs for them to stand and spin on were not far behind. Throughout his personal journey, he juggled a career, sailing, personal life and an unwavering fascination with words – in conversations with great minds like Firing Line and National Review’s William F. Buckley or in the writing of letters and essays. Coulson’s life in New York, his travels, his friends in high and even higher places, his trials as a traveling legal advisor and financier were intermingled with marriage to Edie (now deceased), a woman who was as competent as she was beautiful, the birth of two daughters, Diana who lives in Paris, and Amanda, who returned to Nassau a few years ago to become the curator of the National Art Gallery of The Bahamas. It is there, at NAGB, in a building restored to match the graciousness of the era in which Coulson was born and raised in Nassau in a home not far from there, that he will hold the first book-signing of his memoir on October 8, starting at 6:30 pm. The signing and meet the author event, open to the public without charge, could be the first opportunity to meet the man whose wise counsel possibly impacted domestic investment behind the scenes with private placement offerings and IPOs more than any other single individual. The book is available on Amazon.com and will be available at bookstores around Nassau with additional book signings scheduled at later dates.